So I have been the L. Yuba the last few weekends and presidents days...If you haven't hear fishing has been good. Great mix of hatches. Skwalas, early march Browns, Baetis, caddis, a few PMD looking things....The bugs have the fish eating nymphs and dries during the warmer parts of the day. With the spring weather this week things should really get going. Flows are still really low and this gives the bank angler access to the whole river. Meaning if you are wading you can cross the river and move up and down and across the river with relative ease. Below is a picture of a Brown Trout a client caught this last week. 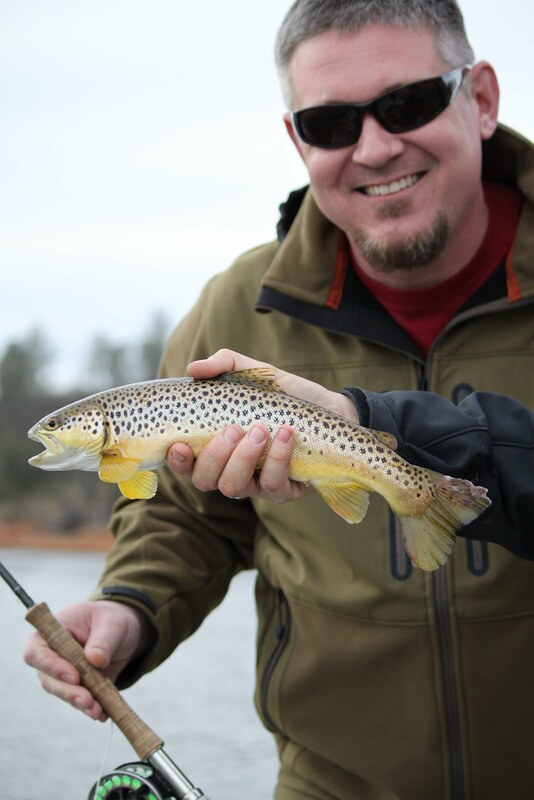 This is the first brown trout I have ever seen, personally, caught on the Yuba. We caught this thing down by Hammond Grove so if it was a wash over from englebright it had a long journey down river.